If you haven't seen it yet, the World Minigolf Sport Federation has launched a new Youth Facebook page that will focus on sharing the accomplishments of the many talented youth around the world that play miniature golf. We encourage everyone that is a fan of this site to like that new page to help support this venture. To kick off their new page, they will be running a series of interviews with some great youth players. We will be re-posting those interviews here to help ensure they get the widest possible audience so we can showcase the next generation of our sport. The following interview can also be found here. First up, its last years male winner of the strokeplay in YEC in Askim, James Lindstr�m from Sweden. JL: When I was a small child, not sure how young, my uncle took me and my little brother to the local minigolf course in Ume� during the summer. We enjoyed it, so we came back and played a few times. On the course, our uncle gave us a lot on handicap so we could compete with him, since both me and my brother love to compete. We won most of the times and had often an ice cream after. One year they started a minigolf training group for any child to join. So, I decided to be a part of it. I had a wonderful time and enjoyed it a lot. In the end, I chose minigolf instead of football, which all of my other classmates preferred which ended up being a lovely decision. JL: I use a 85cm Nifo Ryner and my favourite ball(s) are 3D 143 and 3D BoF - PM 2014 Pedro Carvalho. JL: I prefer concrete the most. It has a lot of testing and finesses in choice of ball, line, tempo and all the other details that the other surfaces doesn�t have as much of. I admire the rounds that you manage to play very well when you have a really small gap of recovery. One of those was a round of 24 on Skoghalls concrete course where I recovered to a shared 3rd and then won the sudden death. That was a great round and a PB on concrete. JL: My role models have changed over the years and have taken direction to find particular things I admire in specific people. 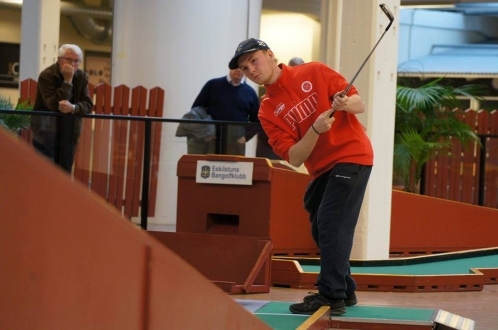 During my early days we had two really good minigolf players in my local club Ume� BGK, Henrik Jonsson and Linn Andersson (both former players in the youth national team). Jonsson still plays today and is a friend and (kind of) rival of mine. JL: Maybe not very unexpected, my biggest merit is from these past two years in the youth national team. 2016 I made it 2nd place after missing the last lane in YWC and losing the sudden death. One of my coaches thought that it was really disappointing and sad because he couldn�t believe I would ever get the chance again. 2017 I repeated the process of going to sudden death for the gold medal, but this time in my favour. I got the chance again, and this time I took it! A truly great feeling and merit I will keep with me my whole life. JL: Apart from the gold medals of YWC, both strokeplay and team, I think it�s from YEC 2016. I was first place after the first competition day. It was a great feeling. I never imagined myself being one at the top at that time. I was always considering Elias Zachariassen as the star player of the Swedish team. So that was a great memory which started a faith in myself that I can play not just good minigolf, but also very good minigolf. Without that self-esteem, I�m not sure that I would be where I�m today. JL: Minigolf includes so many things to me as a competitive player. It�s both technical and mentally challenging. It�s also so important to prepare and think already before the competition starts. The competition starts already at the first practise day. But that�s not all. I�m a very playful person who loves creativity and to be social. On the minigolf course there are so many different people who can enjoy the same sport. There barely any age requirements, gender requirements, skill requirement etc. You can practise the sport just the way you want. It doesn�t have to be a competition. One of most fun things to do, according to me, is trying out something new. Next time you are at your local minigolf course, pick up a random ball out of your bag and try to find a way to play it on as many lanes as possible! Then maybe go one round with that ball? Minigolf is for everyone and minigolf is just what you want it to be. Serious, or not very serious. It�s everyone�s own choice. That�s what I believe is so special about this sport.